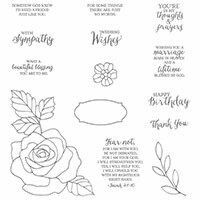 Creating With Joan: Stampin' Up! Weekly Deals are leaving April 18th! Stampin' Up! Weekly Deals are leaving April 18th! Amazing Deals on Stampin" Up! Rose Garden Thinlets Dies and Much More! I received this card at a DOstamperSTARS card swap! I fell in love with the Rose Garden Thinlets Dies immediately! It is so easy to use and create a variety of combinations of designs. The water coloring possibilities with the Rose Wonder photopolymer stamp set is a perfect addition for the Rose Garden Thinlets Dies to create beautifully designed cards! Don't miss this opportunity to save! The Weekly Deals are leaving April 18th! This week get great deals on this die set and much more!